One of the things that amazes us about the game of chess, is the array of people who play it. We have met five-year-olds, who know the basics, and yet their parents don’t know the first thing about the game. There is the smartly dressed business person enjoying a congac and a game with a colleague, or the grease monkey who crawls out from under a beat up old car to make their next move. Kids pick it up in school from friends, teachers, and Harry Potter. It is played all over the world, and by people from every walk of life. This is just amazing. E qually amazing is what people will do with the game to make it their own. Which brings us to today’s topic: Beer Chess. There are as many variations to this game as there are players, but I’ve posted some general rules below. It can be played with shot glasses full of beer as the pieces, or simply using the cans as pieces. There is a suggested board setup below, but just use your imagination. Megachess.com has a set of plastic tops for beer cans, and we are working on a cedar version to match our chess peices and board. Now, in our mind, what can be better than a sunny afternoon spent on the back deck, with good friends, a barbecue, and a few intense games of Beer Chess. This was printed in the ‘Boston Half Baked’. Beer Chess is chess played with beer as the pieces. Beer chess is the unification of the intellect with the inebriated. Beer chess is stimulating brain cells as you kill them. Beer chess was created during a weekend retreat at the McEnaney Estate in Jackman, Maine, thus making Jackman, Maine the Beer Chess capital of the universe. Beer chess is played with beer, a lot of beer. One side uses Light Beer (white), the other side uses regular (black) of the same brands. (see list below) Our research and development team has concluded that one can expect a standard Beer Chess game to last up to five hours, assuming neither player passes out. Intermissions, however, may be declared on a bilateral basis. As you may have realized, this game requires a big board. While beer chess boards are now commonplace in Jackman, in other places their availability is still limited. Again, our R+D team has arrived at a clever solution: bathroom tiles-large white bathroom tiles. Placed on a darker table at regular intervals, one can quickly construct a professional looking Beer Chess set. For and even cheaper board, cardboard coasters, available at most bars, serve as impromptu, portable boards. 1. When one moves a piece, one must sip from the piece moved. 2. When one’s piece is captured, one must drink the entire piece. 5. When one’s pawn reaches the eighth rank, and is exchanged for a queen (or other piece), one’s opponent must drink the remainder of the pawn. 7. One may take as long as one wants to drink a captured piece, but the piece must be quickly consumed when a second piece is captured. 8. After each exchange of pieces, the players must toast each other’s health with the exchanged pieces. 9. When one is put in check, one must sip from the King. 10. Passing out constitutes a resignation. 11. A player may not go the the bathroom before his move. 3) The remainder of one’s pieces. 1. Take big sips out of pieces you expect to trade, when moving those pieces. This technique evenly distributes the amount of beer you will consume, and decreases the amount you will have to drink from that piece when it is traded or captured. 3. Avoid sacrificing pieces for position. A sacrifice will only force you to drink more. Remember, in this game, you can be beating your opponent, not only by the fact that you have a greater number of pieces left on the board, but also by the fact that you have a greater number of surviving brain cells left. Well, it’s that time of year again. The temperatures are beginning to rise, the snow is beginning to melt, and very soon the Snowdrops will be blooming in our backyard. It is also a great time to get ready for the return of our feathered friends. Soon, many of the birds that headed south last fall will return from their winter homes looking for places to raise their new families. Will we be ready? Many of our native species of birds have suffered declines in numbers due to changes in the modern environments. Loss of their natural habitats due to mans evergrowing need for resources and space, competition with introduced species like the House Sparrow (who is a lot more aggressive than he appears), and changes to the available plant-life found in their normal territories are a few of the many factors affecting wild-fowl today. Finding safe places to nest and feed is becoming more and more difficult with each passing year. This time of year is great for hanging new bird houses and cleaning up the old ones. 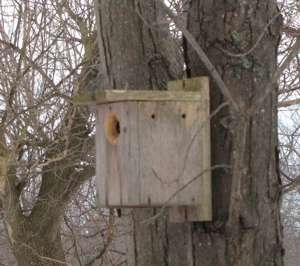 Take a few minutes to walk around your property and inspect the nesting boxes. 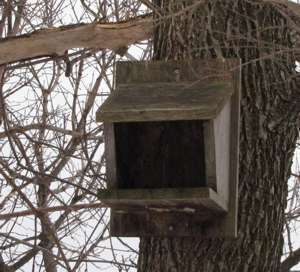 Open up last years nesting boxes and remove any old nests lingering there. Give them the once over to make sure they will survive another breeding season. If they are split, coming apart, or falling off the post it may be time to replace them. Aged looking bird houses are perfect, as most birds prefer a house which blends into it’s surroundings rather than the brightly coloured ‘artistic’ varieties. If the birdhouse hasn’t had any tenants for a while, maybe it’s badly sited. Now would be a good time to move it to a better location. Do you have room for more? Are you attracting the birds you like? Mounting a few new bird houses now would allow them to weather a bit before they are needed. In our minds it’s like washing the ‘human’ off. You’ll also be ensuring that the nesting boxes are in place just in case the birds return a little early. If you have been keeping bird feeders over the winter, then you’ve managed to address the first two concerns for any returning bird – food and shelter. 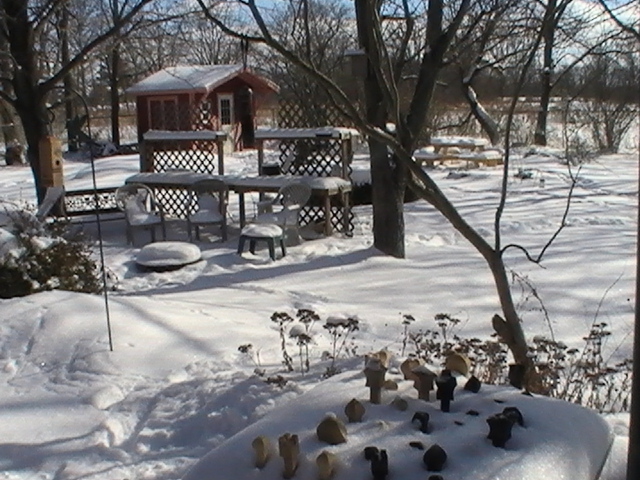 Of course, aspects, such as new plantings and birdbaths will have to wait until it is much warmer, but every little bit you can do now is less you have to do later. When the migratory birds return they immediately begin establishing their territory. Finding a secure nest site, locating food, and ultimately attracting a mate keeps the birds very busy. If we can make it a little easier, then perhaps they’ll have more successful broods. And that means more returning birds for next year. Before long the air will be filled with magical birdsong from sunrise to sunset. Southern Ontario has been under a bit of a cold snap lately. We’re not used to waking up to minus 27­­°C days. But as the saying goes,”If you don’t like the weather in Southern Ontario – wait a minute!” The warm days will soon be here. Fortunately, we’ve been able to avoid the cold by hiding in the shop. The smell of the sawdust, the buzz of the saws, even the wood glue on our work clothes have a way of making us forget about the deep-freeze just outside the door. We have been using the time well. A few ongoing projects were wrapped up, and of course, a few new ones were started. This website was one of the latter. We’re hoping to share some of what we do with everyone. We started with our most popular product, the Camp Chair. I don’t know who to give the credit to, but this is a wonderfully designed chair. It collapses down to a managable size for storing, or transporting. It’s quite sturdy, and most importantly, it’s strangely comfortable. We’ve had reason to sit in them for hours at a time, without the back/neck pain that is usually associated with collapsible wooden chairs. Of course, this is only our impression of them. We’ve received nothing but good comments from the people we’ve made them for. Hopefully, we’ll get some of them to post here. New product pages will be added as time allows, so please stop back from time to time. Or better yet, subscribe to the site and learn about our updates as they happen. Thanks for stopping by. We’ll talk to you soon.